If you happen to have buildings in your city that were proposed a long time ago, but never got built, post them here and talk about it. Even if there happen to be those more than 1,000 feet tall! So far the only cities to have these talls are Los Angeles, Houston, Chicago, New York and Atlanta. The Bank of the Southwest, Houston. 1,401 feet, 82 stories. I wish it was built; Houston would have kept the reputation of being the tallest west of the Mississippi - ever since LA's Library Tower stole the honor in 1990 with 1,018 from Houston's JP Morgan Chase at 1,002 feet. The BofSW Tower does have that resemblance to Philadelphia's Liberty Towers. Frank Lloyd Wright proposed the Mile High Tower at 5280 feet tall. I think it's a joke. Who wants to see this built? Pfft. A mile is insanity at this point. I think eventually we might see buildings that tall, but it will probably be 50 years before something like that becomes economically feasable. Personally, I think it would be cool to see abuilding that tall. In Detroit, the tallest never built was the Book Tower. It would've been over 80 floors, and had it been built, it would still be the tallest building in the city. At the time it was proposed, it would've been the tallest building in the world. Unfortunately, the Depression killed any hopes of this project ever being built. 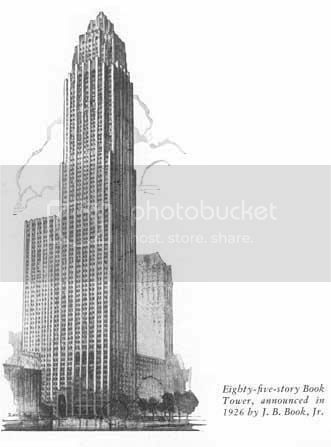 The shorter buildings behind the tower in the renderings are the Book Building and 36 story Book Tower, both of which still stand today. The tower was designed by Detroit architect Louis Kamper, who also designed Broderick Tower, Park Avenue Hotel, Book Building, Book Tower, and Book-Cadillac Hotel. Book Tower was a nice proposal. I don't even want to guess what the office vacancy rate downtown right now would be if it had been built though. Vacancy rates are about 20%. Imagine adding 80+ floors of additional office space to the space that's already vacant in the CBD! Also, what city was the mile-high proposed to? The ironic thing about the mile high tower is that Frank Lloyd Wright hated cities. He was a proponent of what he called "Broadacre City". Basically his proposal involved giving every person in the country one acre of land on which to build a house that blended in with the landscape - one of his Usonian houses. Cities would be emptied out and demolished, returning them to a natural landscape. The Broadacre city proposal had main roads spaced one mile apart. I believe the proposal also called for putting monorail lines along all of the major roads. It is an insane proposal that fortunately never came to fruition. I don't think I could live in such an environment...I need big cities! Grollo Tower first poposed in the latter-1990s, Grollo Tower Mark I - The Denton Corker Marshall proposal - a mixed use tower consisting of office levels and apartments with a beacon gracing its pinnacle. @ a total of 113 floors in the tower section. Its height to top of beacon was to be 1,837ft/560m. It was to be the tallest building in the world @ the time of its proposal. I like that one from Melbourne, and the second one from Sydney. If you mean the DCM proposal for Grollo Tower, yes it would have been fantastic if it had have gone through. 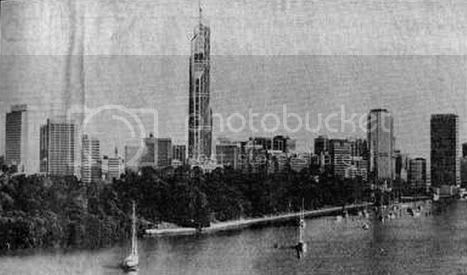 Unfortunately the developers had disputes with Melbourne's Docklands Authorities and instead opted for the 977ft/298m Eureka Tower on the other side of town, now u/c.. It's interesting to note that both the Harry Seidler proposal for both the Grollo Tower & Sydney's CBD-1 have external cross-bracing. Egads, I'm glad the South Pacific Centre wasn't built. SOM's proposal for mixed-use 7 South Dearborn. @ 108-storeys it was to reach exactly 2,000ft/610m to tips of its antennae. It would have been nice to see the Dearborn Center built. Can't say the same for 7 South Dearborn. 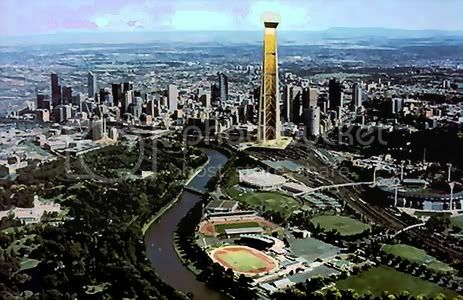 One that was proposed for Brisbane in the late 1980s was to be known as Brisbane Central @ 1,460ft/445m, 107 levels. It's really too bad that the book tower was never built. It would make the skyline look even better then it already does. Maybe after the city completes its revival, it will start doing other projects like this! I hope you're right, Jonzo. I have to wonder though...what would Detroit be like today had the tower been built? Would this tower just be sitting half empty like so many other skyscrapers downtown? Or would this tower have been the start of a huge building boom, turning the Detroit as we know it today into a major center of commerce? It is a question that will never be answered, but it is interesting to think about. I have to wonder though...what would Detroit be like today had the tower been built? Would this tower just be sitting half empty like so many other skyscrapers downtown? Or would this tower have been the start of a huge building boom, turning the Detroit as we know it today into a major center of commerce? I'm afraid this tower, had it been built, would have suffered the same as many of the other buildings after the "Great Escape" to the suburbs in the 50's and beyond. Washington Blvd has suffered for decades now, I see no reason why this wouldn't have suffered along with it. It breaks my heart to see the Book Building with all of those antennas and satellite dishes up there. Whoever designed that gorgeous building no doubt has turn over in his grave now that it has been defaced with those gadgets. On a brighter note, they appear to be moving lots of junk away from the Cadalliac Hotel this morning! Moving away lots of junk? Are they getting ready to do the streetscape in front of the hotel? Because the inside of the hotel is supposedly all cleaned out. I wouldn't imagine that there's much left to haul away. 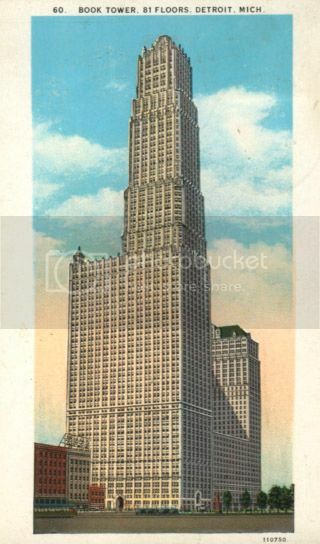 I cant find any pictures or anything but I know that the Atlanta Tower was never built in Atlanta. 2,014 feet and 130 floors. It would probably have been pretty cool though. I loved both those! Dearborn Center was awsome! Jin Mao is based off of it. I like the Miglin-Beitler Skyneedle for Chicago. I think it was a Pelli design? I want to comment on what I perceive as a major flaw with your speculation. Although you base your observation on the fatal reality reality of Detroit, the Book Tower could have significantly changed the downtown core increasing what is termed 'the critical mass' of the CDB built environment. Of course the reality is different, but if the Book Tower was built, it could have resulted in the construction of the subway proposed (and narrowly rejected) of the same decade, which in turn, may have cause addtional highrise construction. Certainly Chicago's CBD, and to some extent Cleveland's CBD, haven't suffered as that of Detroit. With a wonderful river view, alternatives to driving, who knows if the suburban highrise cores would have the same appeal? Hudson's may still be open, and the city with the third largest collection of pre-war high rises would be a very different place.